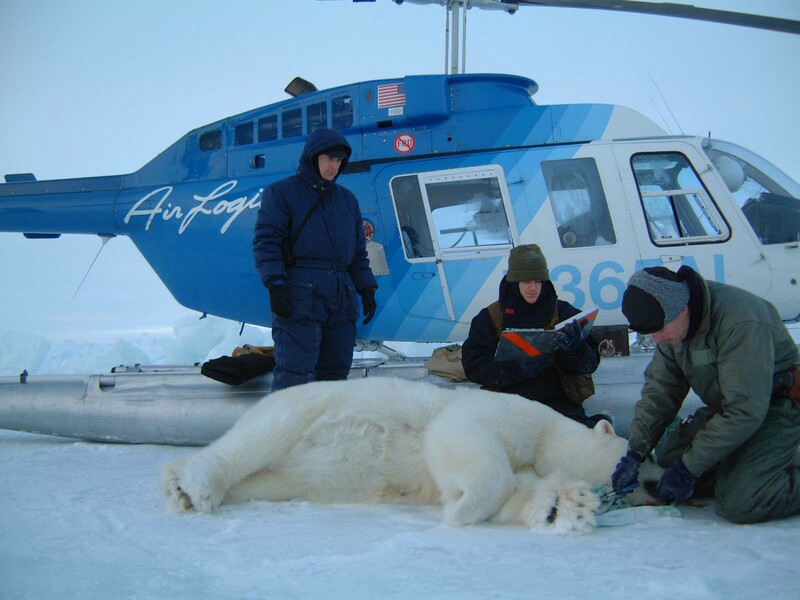 The fact is, most of the monitoring research on Arctic marine mammals requires helicopters and/or fixed wing aircraft (e.g. Aars et al. 2009; Speckman et al. 2011; Stapleton et al. 2014) — aircraft which use huge amounts of aviation fuel, as well as engine oil. There is also the fuel and oil consumed by commercial flights required to get field crews and equipment moved around the Arctic. And don’t forget the rocket fuel needed to launch the satellites that track animals like polar bears and walrus across the landscape, or the small and large ocean-going vessels that are used routinely for Arctic research (e.g., here and here, see below) — they use fuel and engine oil as well. 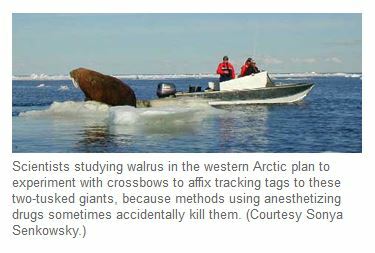 Pacific walrus tagging from a small boat. UAF Seagrant News 2002. Arctic biologists would not have jobs without fossil fuels; they could not study Arctic marine mammals without emitting a huge amount of “greenhouse gases.” How much additional fuel and engine oil would be required for the thousands (or more likely, tens-of-thousands) of hours of aircraft and boat time needed to increase research monitoring of all ice-dependent Arctic species across the Arctic, as they suggest? Do they really believe that referring to fossil fuel use as “greenhouse gases” absolves them from acknowledging and taking responsibility for their massive professional contribution to global CO2 emissions? Apparently, they are of the opinion (as are so many other vocal activists), that only other people should reduce their fossil fuel use to save the polar bears. If these biologists are truly convinced that generating “greenhouse gases” is as serious a problem as they insist, each and every one of them is as big a hypocrite as Al Gore and Leonardo DiCaprio. Footnote 1. IUCN Polar Bear Specialist Group (PBSG) members Kristin Laidre, Eric Regehr, Øystein Wiig, Dag Vongraven, and Fernando Ugarte; as well as Erik Born, Kit Kovacs, Steven Ferguson, Peter Boveng, Robyn Angliss, Lori Quakenbush, and Christian Lydersen. This entry was posted in Advocacy, Sea ice habitat and tagged boats, climate change, declining sea ice, field work, fossil fuels, global warming, greenhouse gases, helicopters, hypocracy, Laidre, Regehr, research, satellite radio collars, surveys, Vongraven. Bookmark the permalink.